By TAPIT (2001), Black type winner, $557,300. Sire of 11 crops. 1179 foals, 963 starters, 111 black type winners, 724 winners, $131,877,331, including Untapable (Champion, $3,926,625), Stardom Bound (Champion, $1,861,610), Hansen (Champion, $1,810,805), Unique Bella (Champion, $1,272,400), As de Trebol (Champion, $126,173), Chachkova (Champion twice), =Tapit Girl (TUR) (Champion), Frosted ($3,972,800, Mohegan Sun Metropolitan H. [G1], etc. ), Tonalist ($3,647,000, Belmont S. [G1], etc. ), Cupid ($1,701,873, Gold Cup at Santa Anita S. [G1], etc.). Prospect Park enters the stud in 2019.
at 5, one win, once 2nd, once 3rd (Californian S. [G2]). Total: 4 wins, 7 times 2nd, 3 times 3rd. CLEAR ATTEMPT (c, by A.P. Indy). 3 wins at 3 and 4, $205,617 in US. Won Poker S. [G3]. Capriati (f, by Brethren). Placed at 2, 2018, $36,200 in US. 3rd FTBOA Florida Sire Desert Vixen S.-R (GP, $11,000). Unionize. 5 wins at 4 and 5, $114,228 in US. Radio Silent. 2 wins at 4, placed at 5, $63,240 in US. Floral Romance (f, by After Market). 3 wins at 3 and 4, $170,768 in US. 3rd Endeavour S. [G3], Swingtime S.-R (SA, $9,288). Producer. Luvthatmustang. 3 wins at 3, $74,260 in US. Ebbycalvin Laloosh. 4 wins at 3, $62,638 in US. PROSPECT PARK (c, by Tapit). Black type winner, see records. Heroically (g, by Giant’s Causeway). 10 wins, 4 to 9, $170,334 in US. Gentle Romeo (g, by Benchmark). 4 wins, 3 to 6, $125,090 in US. Liberty Park (g, by Tapit). Winner at 3, $35,715 in US. Power Source. Winner at 2, 2018, $20,350 in US. Art Collection. Winner at 3, 2018, $89,580 in US. Game Winning Shot. Winner at 2, 3 and 4, 2018, $45,599 in US. Warm Hugs. 3 wins at 3 and 4, $148,378 in US. Dakota Candy. 7 wins, 3 to 5, 2018, $101,374 in US. Yankee Romance. 5 wins, 2 to 4, $74,540 in US. Honorable Hero. Winner at 2, 2018, $45,110 in US. WINTER CAMP (g, by Forest Camp). 9 wins, 2 to 4, $240,395 in US. Won Bill Thomas Memorial S. 2nd Iowa Sprint H. [L] (PRM, $25,000). I’m Popeye (g, by After Market). Winner at 2 and 3, placed at 5, $44,114 in US. 3rd Bert W. Martin Foundation S. [N]. Yankee Station. Winner at 3 and 4, $111,040 in US. R EL JEFE (g, by Benchmark). 10 wins, 2 to 7, $172,698 in US. Won A.T.B.A. Fall Sales S.-R (TUP, $38,491). 2nd Lost In The Fog Juvenile S. (TUP, $10,000). BELLA CARDONA (f, by Bertrando). 2 wins at 2, $52,631 in US. Won A.T.B.A. Fall Filly Sales S.-R (TUP, $45,813). Producer. MIRANDO (f, by Bertrando). Winner at 3, $6,488 in NA. 10 wins, 4 to 6, $107,608 in US. Won Shy Riannon S. [N]. 2nd First Snowbound S. [N]. 3rd Princess Of Palms Handicap [N] (TUP, $4,500), J’Aime Jeblis S. [N], Betty An Bull S. [N], Kathryn’s Doll S. [N]. (Total: $114,096) Producer. Mesa Magic. 4 wins at 3 and 4, $102,820 in US. Sacred Mountain. 8 wins, 3 to 7, $68,140 in US. Bass River (g, by Benchmark). 3 wins at 3 and 4, $32,114 in US. Official Decision (c, by Deputy Minister). Winner at 3, $30,020 in NA. LOCAL REASON (g, by Olmodavor). 4 wins at 2 and 4, $68,041 in US. Won Turf Distance Series Final Starter S. [N] (TUP, $15,095). Lukies Lady. Winner at 2, placed at 3, 2018, $11,276 in US. Brisa De Mar (f, by Pirate’s Bounty). Black type placed winner, see above. 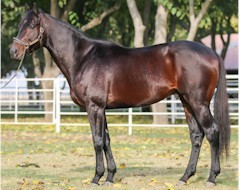 Strategic Alliance (g, by Pirate’s Bounty). Winner at 2, 5 and 6, $42,072 in NA. 2nd I’m Smokin S.-R (DMR, $11,000). 3rd Precisionist S. [L] (HOL, $7,500). Art of Speaking (f, by Pirate’s Bounty). 3 wins at 3 and 4, $70,725 in NA. Producer. Twin Task. 10 wins, 3 to 7, $136,986 in NA. Rasayana. 8 wins, 3 to 6, $96,839 in NA. Viga’s Bounty (g, by Pirate’s Bounty). 2 wins at 3, $6,526 in NA. Bert’s Law (g, by Bertrando). 5 wins, 2 to 4, $164,882 in US. 2nd Gold Rush S. [L] (GG, $15,000). 3rd California Dreamin’ H.-R (DMR, $12,000). Barista (f, by Pirate’s Bounty). Unraced. Producer. Handleman. Winner at 3, 4 and 5, $132,030 in US. VICTORIA EUGENIA, by *Jardiniere. Won Pr Arturo Munoz Gamboa (CHI), Pr Ernesto Bouquet N. (CHI), Pr Raimundo Valdes Cuevas (CHI). 2nd Pr Manuel Hurtado Vial (CHI), Victorino Garrido Falcon (CHI). 3rd Pr Carlos Dittborn Pinto (CHI), Pr Luis Larrain Prieto (CHI), Pr Roberto Vial Souper (CHI), Pr Velocidad (CHI). Half-sister to =POSITRON (CHI). Dam of 3 foals to race. VIGA (CHI) (f, by =Schleswig). Black type winner, see above. =Versado (CHI) (c, by =Schleswig). 3rd Cl Vina Undurraga S. A.-G3 (CHI). =Viento Bravo (CHI) (c, by *Balconaje). 3rd Pr Vina Undurraga S. A.-G3 (CHI), Pr Carlos Cousino (CHI). Retired to stud, to stand in 2019 at Harris Farms. Pedigree with graded stakes winners that raced successfully in California at the highest level. SILENT SIGHS Grade 1 winner, PROPOSED etc. Ultra consistent son of leading sire and sire of sires TAPIT! On the board 14 out of 18 starts. Grade 3 winner and multiple graded placed winner of $539,770.